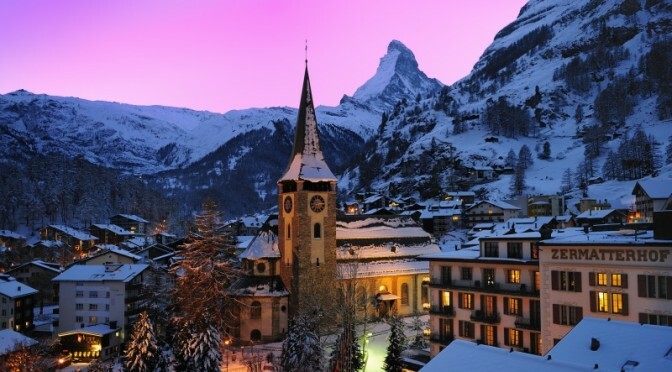 Zermatt, Switzerland – With a decent base of snow, we booked a trip to the charming Swiss ski resort of Zermatt for February 2014 with only three weeks’ notice through the Diamond Dogs ski club of New York City. With new snow immediately prior to arrival, and two storms while there, we experienced the best snow conditions that I ever have in the Alps. 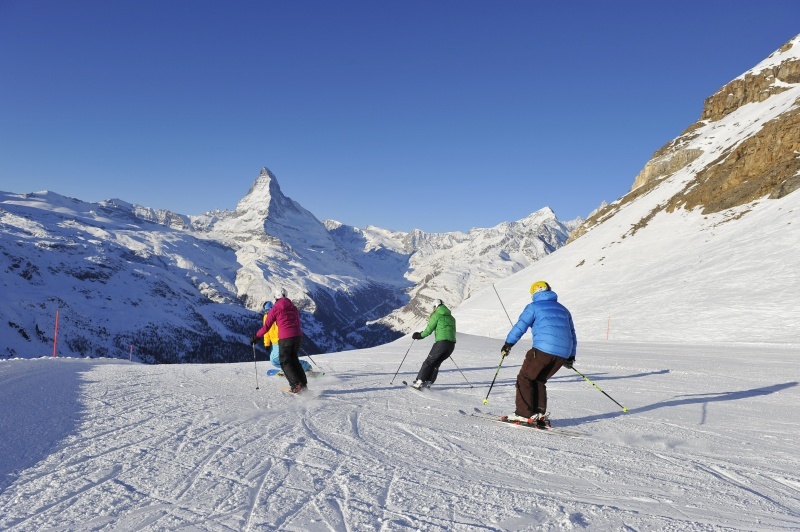 Zermatt’s skiing is generally divided into three sectors by its access lifts. The mostly west-facing Rothorn sector is reached from town by an underground funicular to Sunnega. The top of Rothorn is at 10,177 feet, also served by a north-facing chair from Kumme. There are longer partially south-facing runs from Rothorn to Gant and Findeln. A train runs every 24 minutes starting at 8 a.m. from town to the top of Gornergrat, Zermatt’s second skiing sector, at 10,132 feet. The ride usually takes 33 minutes with four stops along the way. Gornergrat is also mostly west-facing, with a north tilt to the steep bowl below Riffelberg that is served by a gondola coming back up from Furi. 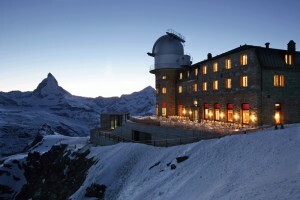 The Gornergrat and Rothorn sectors are connected via a vast, mostly north-facing expanse of terrain served by a 3,450 vertical-foot tram rising from Gant to Hohtalli at 10,778 feet, as well as the shorter Breitboden chair coming out of Findeln. Hohtalli has a few long and scenic pistes on skier’s left, with steeper ungroomed terrain skier’s right, also served by two surface lifts including Stockhorn, topping out at 11,168 feet. The Matterhorn/Schwarzsee sector is only connected to the rest of Zermatt’s skiing at Furi, just 800 feet above the town of Zermatt. 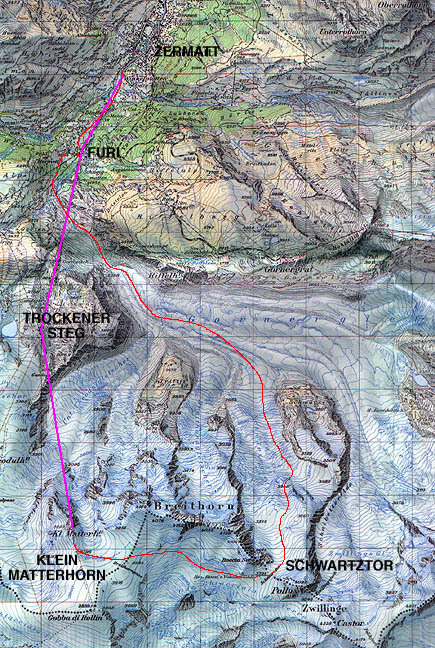 A tram and four-stage gondola each rise from Furi to Trockener Steg at 9,640 feet. From there, the Klein Matterhorn tram ascends to Europe’s highest lift served skiing at 12,736 feet. There are several surface lifts on the Theodul Glacier that are used for year-round skiing. Most of the terrain from the glacier down to the steeper slopes below Schwarzsee faces north. From the Theodul Glacier you can ski into Italy via Theodul Pass at 10,827 feet or Plateau Rosa at 11,414 feet. Mostly west-facing trails lead from each of these points to the Italian resort town of Cervinia at 6,700 feet. If you get into Italy early, you might have time to ride up to Cimi Bianche 9,781 feet and ski the southwest-facing slopes down to Salette. 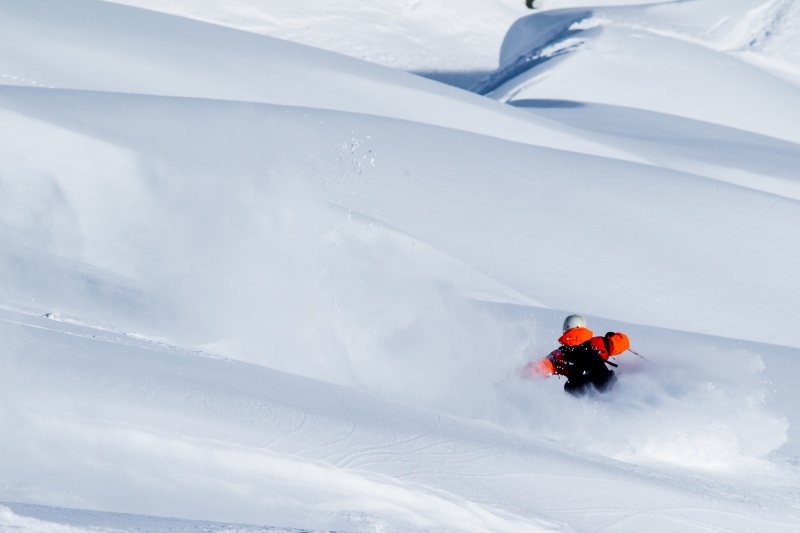 Exposures are based primarily upon designated runs and nearby ungroomed terrain. Annual snowfall statistics were supplied by Fraser Wilkin of weathertoski.co.uk. Powder and high/low month stats were derived by scaling these to resorts in the Alps with monthly information available. Snowfall information is often less useful in the Alps than North America due to both the huge vertical drops, across which snowfall varies widely, and the fact that most measurements are taken at resort elevations. 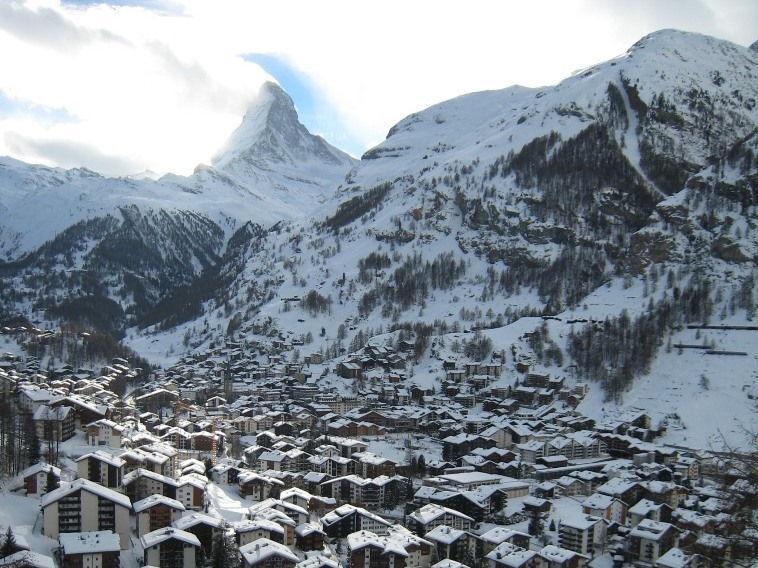 Zermatt is a classic example of this anomaly, with very modest snowfall of 99 inches measured in town at 5,372 feet. There is no public information available from higher up in Zermatt, but there is about a decade of information available from Cervinia’s base, mid and top stations. Cervinia’s Plan Maison is at the same elevation as Schwarzsee, Riffelberg and Blauherd in Zermatt. The local impression is that snowfall at comparable elevation is slightly higher on the Cervinia side, but preserves better with more north exposure on the Zermatt side. Prevailing Atlantic storms have to pass over several other sections of the Alps before reaching Zermatt. Like the Italian resorts, Zermatt does better in years when more storms come from the Mediterranean side of the mountains, as they did in 2013-14. Colorado skiers will be familiar with Zermatt’s snow profile. Snowfall accumulates gradually but preserves superbly. Guides warn that the advanced Stockhorn area may not be open before February. Ski altitudes are comparable to those at Aspen and Vail, but Zermatt is situated seven degrees of latitude farther north with far lower skier density. Winter snow on the Theodul glacier and in Stockhorn/Hohtalli may thus last as long into the spring as at the highest Colorado areas like Arapahoe Basin. Prices and crowd levels in the Alps are both higher during the school holiday season from mid-February to early March, which coincides with the safest period for snow conditions at most resorts. Zermatt’s modest snowfall but ideal snow preservation make the period after the school holidays more attractive, excluding another holiday crunch during Easter Week, and the period before the school holidays less so for those want to reserve far in advance. There was so much snow and cloud cover during our week last February that only direct south-facing slopes exhibited even a hint of transitional snow. Visitors during March and April, however, should expect spring conditions in the west-facing Rothron, Gornergrat and Cervinia sectors, and time their skiing in those areas accordingly. The upper chairs at Cervinia run until 3:45 p.m. and even remote Zermatt lifts run until at least 4 p.m. There are only two ski trails that lead back into the town of Zermatt, and while conditions on those two runs were fine on our trip they can easily deteriorate with skier traffic and no fresh snow. Fortunately all three access lifts (the Sunnega funicular, Gornergrat train and Furi gondola) have as much downloading capacity as upload, so it’s easy to skip those two trails at the end of the day if desired. Good snow in the Alps is often accompanied by weather that can limit one’s skiing at a high Alpine resort like this. So with decent weather predicted for our first day I hoped to cover more ground than the ski club’s planned schedule allowed. At around 9:30 the group headed up the underground funicular railway to Sunnega, and then boarded the gondola to Blauherd. There was a fog patch on the warmup run back to Sunnega, so we got below the lift and eventually regrouped at Blauherd after riding the 2,000 vertical-foot chair from Patrullarve. Though mostly overcast with occasional sunny breaks, there was no fog up high so we went up to Rothorn to ski the three marked runs on the northwest side of the 1,100 vertical-foot Kumme chair. We were pleasantly surprised to find only occasional tracks in the powder between the pistes. We skied 3,000 vertical feet off the back of Rothorn via the winding Piste #19 to Gant. There were a few opportunities here, too, to cut the switchbacks and ski some fresh snow. From Gant we took the gondola back to Blauherd, arriving at 12:10. Most people skied down to Sunnega for a scheduled 12:30 cafeteria lunch, but Liz and I decided to take an extra run down to Patrullarve, enjoying some powder in scattered trees along the way. After lunch Liz and I ventured on our own, starting with the yellow (meaning ungroomed) ski route #10 down to Findeln. This faces south and the moguls down the middle of the run were sometimes scraped, but there were open sections of powder to the sides. We took the chair to Breitboden and Piste #26 back over to Gant, where we loaded the tram to Hohtalli with the intent of skiing the long and scenic Piste #28, but our attention was diverted by the sight of a huge, empty and moderately steep bowl under the lift just skier’s right. With no one else in the bowl at 3 p.m., we had plenty of room to lay our own tracks for 2,500 vertical feet down to ski route #31 that leads back to Gant. I skied down to Findeln and rode up to Sunnega, where many skiers were admiring the first available Matterhorn view of the day. It remained clear while I skied the long trail to the bottom, with a nice overview of the town of Zermatt. With 24,500 vertical feet of skiing, 7,000 of which were in powder, and famed scenery at the end of the day, the week was off to an amazing start. Weather moved in for our second day, prompting the club to abandon its plan to ski into Italy. The entire Klein Matterhorn side of Zermatt remained closed all day by the weather. After a big first day and clearing predicted for the next two, neither Liz nor I were motivated to ski adventurously or battle poor visibility off piste. We boarded the 10 a.m. train to Gornergrat. We stopped by the Iglu Dorf, an igloo bar just below Rotenboden where Liz was greeted by a friendly St. Bernard dog who let her know that the facility was reserved for a private event that day. We twice skied down to Furi, barely venturing into a corner of the big bowl below Riffleberg as we didn’t want to commit to a longer run in bad visibility. The day was disappointing, as the predicted six to 10 inches never fell in the Gornergrat or Rothorn sectors despite fog and thick cloud enveloping the mountains. We would discover the next day, however, where it did snow. There are many consolation prizes available in the Alps when the weather fails to cooperate for skiing, and Zermatt is viewed by many as having the best on-mountain restaurants in the world. We found Zum See just below Furi and they squeezed us in. As at many places in Zermatt, original farm buildings are also preserved. We were seated in a glassed-in area that is used for alfresco dining in nicer weather. After dining on spinach and cheese tortellini, fish soup and air-dried beef and cheese for lunch, followed by apple strudel with custard and red wine plums with cinnamon ice cream for dessert, we finally rolled out of Zum See at 3:20 p.m. to ski the last 400 vertical feet to the northern edge of Zermatt and catch a bus back to our hotel. With clear blue skies the Diamond Dogs got out of bed early and took the bus to the Klein Matterhorn sector’s gondola base. The lift passes through stations at Furi, Aroleid, Schwarzsee and Furgg before finally arriving at Trockener Steg, where we boarded the Klein Matterhorn tram. The Klein Matterhorn’s upper station is drilled directly into a solid rock peak through which you walk though a long tunnel to exit onto the top of the Theodul Glacier. We skied to Plateau Rosa and despite the fairly benign weather we were surprised to see the trail into Italy closed. It was cold, perhaps 10ºF early in the morning, but the wind below the tram had mostly abated. So we skied the very flat terrain adjacent to the T-bars down to the Furggsattel chair. With lots of people skiing that chair as they waited for the route to Cervinia to open, it got tracked out very quickly. That new snow was very light and dry, similar to that found in Utah or Colorado, but you still had to be aware of where the slope flattened in order to bail out in time to a groomed piste. From the top of Furggsattel we looked off the back into Cervinia. We could see people unloading from the next-to-top chair, but the top chair was not running. On our second time up there we saw groomers working the top piste. With no activity after our third chair ride we skied a longer run down to Furgg. It was nearly 12:30 p.m. by the time we returned to Trockener Steg, so we decided to take the T-bar up to the Gandegghutte refugio for lunch if the runs into Italy remained closed. While riding the first T-bar we observed people disappearing over Theodul Pass, and so we continued up the second lift to Plateau Rosa. Barely into the piste into Italy there was a vast bowl off to skier’s right with perhaps 10 tracks in it. Below its rollover the powder was thigh deep for 1,300 vertical feet, the deepest lift-served snow I had skied in three years. There was a moderate traverse out of the bowl to a fairly long but crude plowed road. I followed it to the designated lunch meeting at Plan Maison, elevation 8,200 feet, but by this time nearly all of the Diamond Dogs had given up on the border opening and skied back down toward Zermatt. Liz had skied from Plateau Rosa all the way down to the town of Cervinia at 6,700 feet. While she was returning I rode the Plan Maison chair and skied the piste to Chalet Etoile, one of the world’s top on-mountain restaurants. Reservations are often needed. But with the delayed opening vexing the plans of many headed there from Zermatt we were able to be seated in 10 minutes and were soon indulging in another gourmet feast. Liz and I shared black pasta with squid and jumbo prawns and a pumpkin, prosciutto, asparagus and cheese risotto, finished off by a mixed fruit crostata dessert. It’s safe to say I’ve never before skied that quality of powder followed by that kind of lunch! The last chair out of Plan Maison to return to Zermatt loads at 3:45 p.m. The trip requires three lift rides in total, but only the top chairlift — Bontadini — is steep enough to ski powder. We saw a few other creative lines people skied from Plateau Rosa into Italy. We crossed back into Switzerland at 4 p.m. and were soon treated to classic views of the Matterhorn to the northwest and the Monte Rosa to the southeast. We could also see east to Gornergrat and Hohtalli on the far side of the Gorner Glacier. We made it back to town below Furi at 5 p.m., skiing 20,300 vertical feet for the day. As for the 5,000 vertical feet of untracked fresh snow, even the most jaded western powderhounds would have been wowed by its quality. I looked for guided off-piste options as I have on prior trips to the Alps, and soon found a list from the Zermatt Alpin Center. The Schwarztor appeared to be Zermatt’s glacier skiing counterpart to Chamonix’s Vallee Blanche. Unlike Vallee Blanche, however, there is a considerable approach involved, so alpine touring gear is recommended. I brought mine while Liz had to rent. Skies were clear as they had been on Tuesday, but there was much more wind blowing up high. In fact, the Klein Matterhorn tram was closed to the public, but we were allowed up there with our guide, Gianni Mazzone. We had a clear view of the 15,199-foot Dufourspitze, second highest peak in the Alps. With blowing snow and -18ºC temperatures we geared up inside the restaurant. As we skinned to the east it was fortunate that the northerly wind was blowing from behind our left shoulders. Gianni nevertheless frequently checked Liz’ left cheek for signs of frostbite. Mine was slightly swollen and blistered by the end of the day even though I had my face tucked into my hooded jacket. After a half hour of skinning we transitioned to ski mode for a traverse and very short ski. Our skinning pace was slow but steady, set by Gianni precisely at Liz’ comfort level even though the entire trip took place above 12,000 feet, which is no mean feat when you’re sleeping at 5,300 feet in the village of Zermatt. Upon reaching the top we continued to skin for a while across some tricky sastrugi to escape the wind and find the sun to transition to ski mode. The start of skiing at 12,200 feet was on smooth windpack with a thin layer of soft snow on top, but the snow soon became deeper powder. We eventually traversed through a picturesque ice formation to ski the final pitch, avoiding some exposed glacial ice. Nearly all of the 4,000 vertical-foot descent of the Schwarze Glacier was in fresh powder. We finally emerged onto the flat Gorner Glacier at about 8,000 feet. Out in the sun we had panoramic views down to town and back up to the Monte Rosa, where a silver-domed hotel at 9,167 feet is used by summer hikers. At 7,000 feet we reached the toe of the Gorner Glacier, and from there the exit trail winds through a narrow gorge, with the final descent through an open field with scattered boulders left by the retreating glacier. We soon joined the piste heading to Furi, where we stopped at Les Marmottes at 3:30 p.m. for some drinks and soup. While I would not define the day as an “Easy Tour” as the Zermatt Alpine Center brochure does, the Schwarztor is indeed a “must” for alpine touring, with amazing scenery and likely some good powder if you want to get well off the beaten path in Zermatt. Our fifth day again featured bad weather. Overcast skies were predicted but it snowed most of the day. We took the Gornergrat train up and the #29 piste to cross to the Rothorn side. Gant was closed, so we skied down to Fideln and took lifts up to Blauherd. In this weather the Patrullarve chair was the only viable option for skiing off piste, so we took three runs in there by 12:30. The top of Patrullarve is still above tree line, so finding desired entries into the steeper sections with stunted trees required careful navigation. After the third run we encountered our trip organizer, Jackie, skiing with three other Diamond Dogs — Mark, Chris and Janet — so we suggested trying to find Chez Vrony at Findeln, perhaps Zermatt’s most famous on-mountain restaurant. We became separated in the fog and snow but both groups made it to Chez Vrony and managed to get seated at 1:20 p.m. after a modest wait. Lunch options included lamb, and also perch with garlic foam and veggie risotto. Mark and Chris shared the famous $35 Vrony burger and said it was well worth it. We all shared the caramel dessert special and apple fritters in vanilla sauce. 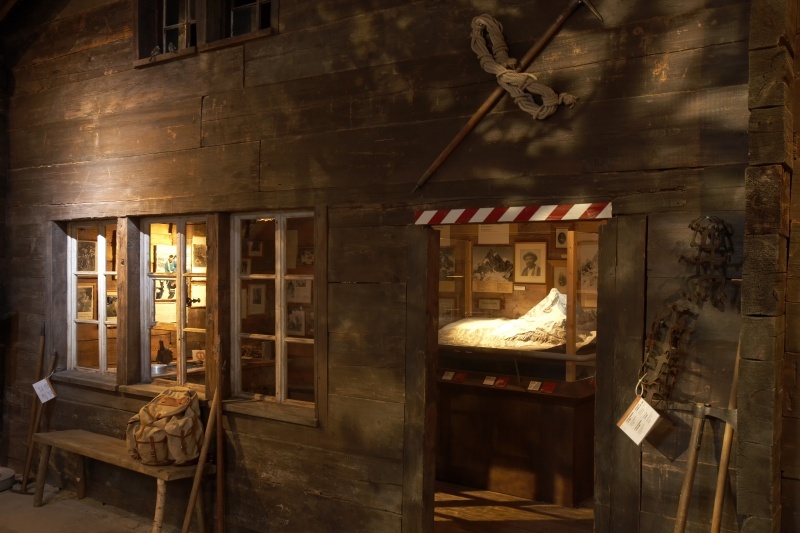 We visited the Matterhorn Museum in Zermatt before dinner, where antique skis from late 19th century were on display along with a route diagram for the seven climbers who first summitted the Matterhorn on July 14, 1865. The rope, also preserved in the museum, broke on the descent, killing four of the climbers. We were supposed to have a group dinner at the top of the Gornergrat, but it was canceled due to the ongoing storm that would provide a powder day on Friday. Visibility would be the only question. Weather was predicted to improve throughout the day so we didn’t board the Sunnega – Blauherd gondola until 10 a.m. Seeing the Rothorn above socked in, but also spotting several tracks dropping off the #7 blue piste toward Findeln we made that our first run. The partial south exposure left some crunch beneath the powder but also provided better visibility. We noticed that the Breitboden chair was running across the valley, so that was our next destination. We were soon to discover that the lift must have just opened, for the #25 piste back to Findeln was untracked. After another run we headed toward Riffelalp, working as much powder as possible before dropping onto the #27 piste. The only lift from Riffelalp is the Gornergrat train. We disembarked at Rotenboden and headed down to Furi. Visibility in the bowl below Riffelberg was as bad as it had been on Monday, but with deeper snow I dropped into it anyway, using a few rocks and shrubs as points of reference before I continued through a narrow saddle into more powder amongst scattered trees. When the terrain began to narrow into a V-shaped gully, I followed a traverse track back to piste #42. The reason for the detour to Furi was to go up to Schwarzsee and ski yellow routes #59 and #60, half of which are below the tree line. This was a good call, as visibility was better than at comparable elevation at Riffelberg and few people had been skiing it. Both runs have mellow pitch above the tree line, steepening into gullies below. Each sported 1,500 vertical feet of lightly cut up powder. As good as Schwarzsee was, I still wanted to head back toward Hohtalli and Rothorn just in case the anticipated clearing materialized. The cloud had lifted well above Riffleberg when we arrived, so we took a mellow powder run near the igloo. Blue skies never appeared, but the cloud layer finally lifted above the top of Hohtalli by 3 p.m. and we saw its tram moving. So we headed over there via pistes #29 and #26, with lots of untracked snow between the switchbacks of #29. We skied the yellow route #30 that I had skied late Sunday. With the tram having just opened there were just a handful of tracks, so we had plenty of room to make our own. Liz and I arrived at Gant at 4:40 p.m., 20 minutes after the lifts had closed. No one was there, so I called the phone number on the trail map and was informed that it would cost 270CHF to turn the gondola back on. So we chose to do a little hiking, which would surely be less strenuous than our Schwarztor tour two days earlier. We first trudged from Gant for 10 minutes up toward Grunsee, then skied a shortcut over to piste #25, which was being groomed by a winch cat. The trail map shows a “projected” piste #21 direct from Gant to Findeln, but it has not yet been cut. At Findeln we had to hike a short distance up piste #6. Another cat driver showed us where the hiking trail down to Zermatt started, by the Enzian restaurant and a few other huts. Lower down the hiking trail is a narrow cut into a steep hillside with lots of trees, so even though it’s tedious snowplow we thought it best to stay on the trail most of the way down. We eventually reached the Gornergrat train tracks and skied alongside them to our hotel, not arriving before 6:15 p.m. In European ski complexes like Zermatt, a day-by-day description of one’s personal experience as above is often most illuminating. Below are our overall impressions, recognizing that we didn’t see everything in a week and experienced far above average snow conditions. Cruising: Interesting and scenic groomed runs link all sectors of Zermatt and Cervinia, except for the expert Stockhorn area. In the Alps over 90% of skiers stick to the groomed runs, so slope congestion, moguls and hardpacked snow can be issues. Surfaces were great during our week, but some of the ski club members noticed increased slope congestion relative to North American resorts. I noticed it mainly on the bad weather days when people were less dispersed as they sought runs with better visibility. On nice weather days, the long #28 and #29 pistes descending from Hohtalli and Gornergrat have plenty of elbow room and a more wilderness-like ambience. Moguls: The yellow marked “ski routes” are never groomed and will usually sport moguls after a few clear days. Thanks to high altitude and ideal exposure, routes 30-34 on Stockhorn and Hohtalli are noted for consistent packed powder. The lower routes below Schwarzsee and the more sun-exposed routes on Rothorn may need to be timed for soft snow surfaces. Steeps: There are numerous steep bowls and chutes near and above the Stockhorn/Hohtalli ski routes. The boundary of terrain that is controlled to protect pistes and ski routes, though, is not well defined. Stockhorn was not open during my week in Zermatt, and an avalanche there was visible to guided ski groups near Hohtalli. Steep sectors not close to open ski routes should be skied with a partner, rescue gear and favorable snow stability in the uncontrolled terrain. Wide Open Spaces: The tree line at Zermatt is situated at about 6,500 feet, and the vast majority of skiing, especially in better snow, is located above it. Trees: As at most resorts in the Alps, skiing in the trees at Zermatt is limited. The trees above Patrullarve were popular with many of the Diamond Dogs during our week, and the trees near the skiroutes below Schwarzsee were also good. In general, the trees are at low enough elevation that snow conditions tend to be worse than they are higher up, but our week was a happy exception. .
Powder: Average snowfall at Zermatt is modest, but on the higher, sheltered slopes powder can preserve for many days. I’ve previously observed the lesser competition for powder in the Alps when compared to North America, but never on such sustained fall lines. 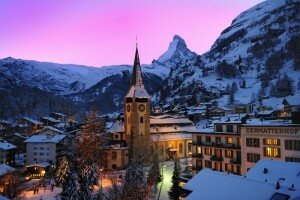 Other visitors have observed powder lasting longer in Zermatt than in comparable terrain in St. Anton and Val d’Isere. 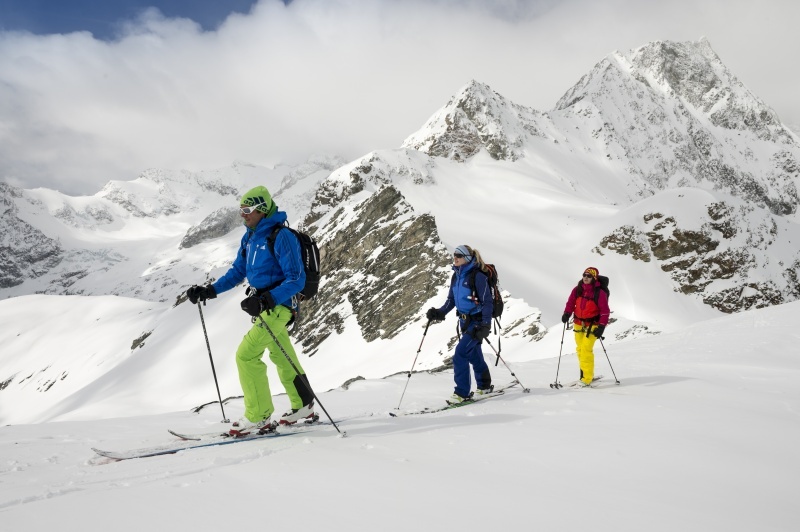 Hiking and Backcountry: There is some debate about how often it’s necessary to hire guides to maximize ski quality in the Alps. Some will want guides to explore the farther reaches of Stockhorn and Hohtalli, as some of the ski club members did on Wednesday. The tours run by the Alpin Center take place at high altitude glaciated terrain where guides are essential. Crowds: My week in Zermatt was the last one before the school holiday period. Combine that with the unsettled weather and we experienced minimal lift lines and rarely congested slopes. Some of the lodges and restaurants were quite busy at lunch, and reservations are recommended for the more famous places, especially during busier weeks. Intermediates: Zermatt is an excellent intermediate ski destination. Along with a comprehensive array of groomed pistes, there is often nicely pitched untracked snow adjacent to the groomed pistes in which to prefect your powder technique. Novices: On the trail maps, blue is designated as “easy,” but true novice terrain is scattered among the three major sectors at Zermatt and is somewhat limited. There is a small learning area below Sunnega, served by its own gondola. 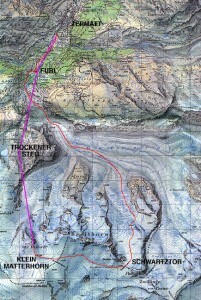 There are quite long easy runs up high on the Theodul Glacier, but they are served by T-bars. Cervinia is thus a much better destination for beginners than Zermatt. Most will be comfortable on blue runs there, certainly on the two chairs that I observed above Plan Maison. The Theodul Glacier is as accessible from Cervinia as from Zermatt. The Resort: There is no getting around the fact that Switzerland is the most expensive ski country to visit in Europe, and even within that context Zermatt is a premium resort. It’s therefore a good idea to select a hotel with a “half-board plan” that includes breakfasts and dinners. The Diamond Dogs’ $1,430 price included lodging, breakfasts, five dinners and the ground transfers from Geneva airport. It did not include $480 for six days of Zermatt/Cervinia lift tickets, which is similarly priced to U.S. ticket packages and more expensive than most resorts in the Alps. We stayed at the Hotel Perren, which is within a block of the funicular to Sunnega and a five- to ten-minute walk to the Gornergrat train and Bahnhofstrasse shopping district. The Perren has a basement steam room, sauna and showers for après-ski. 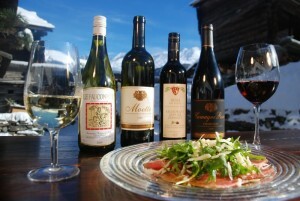 The hotel’s dinners were very satisfying, though not of the gourmet quality of those three on-mountain lunches at Zum See, Chalet Etoile and Chez Vrony. Gasoline cars are banned from Zermatt, and there are electric taxis and buses running the length of town. With ski gear in tow we used the bus if we started or ended the day at the north end of town below Furi. On a couple of days the Diamond Dogs met after skiing at the Papperla Pub for drinks and live music, located a few blocks from our hotel. Zermatt is a world-famous resort in both winter and summer, and rightfully sits on many people’s “bucket lists.” I thus had very high expectations, and they were exceeded on most counts.